Chunga's. This is the place you go. For real tacos. Street taco style. Mexico City style. A few months ago my good amigo Ruben told me that he heard about this place from family members. Ruben is from a city which is very close to Mexico City so while he is no chilango, he is no stranger to what a good taco al pastor is. I tried them the first night and I was blown away. I couldn’t stop eating. I immediately felt an amistad with the cooks, servers, and owner. This place makes you feel at home. 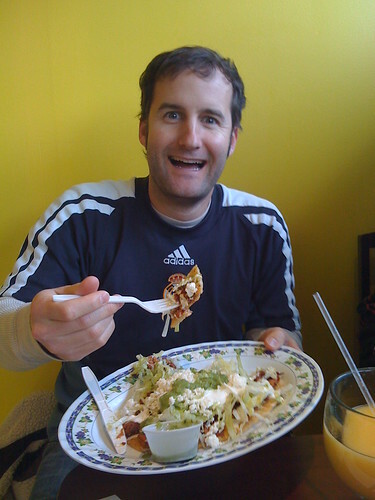 Taco enthousiast (and co-worker) Jeff cant wipe the damn smile off his face as he eats tacos at Chungas. He was recently quoted as saying "The chicken tacos were good. But when I tried the al pastor it was like I was transported... to another planet." I recorded that on my phone. Because I am a professional taco journalist. Since I didn’t want to fly off the handle I decided to curb my taco emotions and try the place again. And again. And again. Already this place has become the new favorite restaurant of all my co-workers. Last time I walked in the door I saw two tables of co-workers I didn’t intend on seeing there. 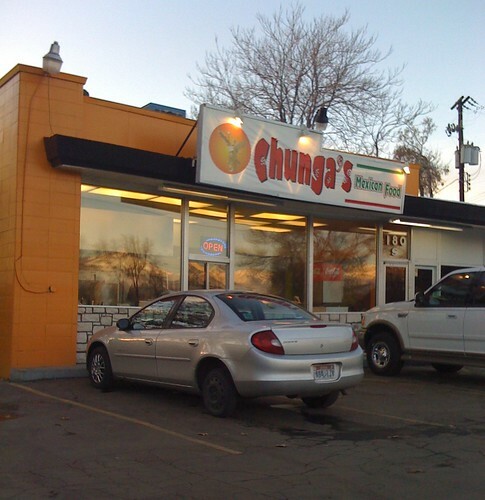 Word of mouth has been carrying the name CHUNGA’S around the hallways. Like I said, I have been back to Chunga’s at least weekly (3 times last week) to make sure that I was not mistaken in this review. I have tried many of the standard items on the menu like tacos al pastor and chicken tacos. After trying most everything on the menu by this point, I highly recommend the huaraches. At least once. What are huaraches? Meaning “sandal”, you can see the resemblance with its oblong shaped cornmeal frybread covered with your choice of meat (get the pastor), sour cream, and covered in queso de oaxaca. Whoa. I’ve tried several other of the antojitos shown on the posterboard below but I have many yet to try. The nopales are delicious. The quesadillas are wonderful. But my heart flutters and my mouth waters thinking of the tacos al pastor. 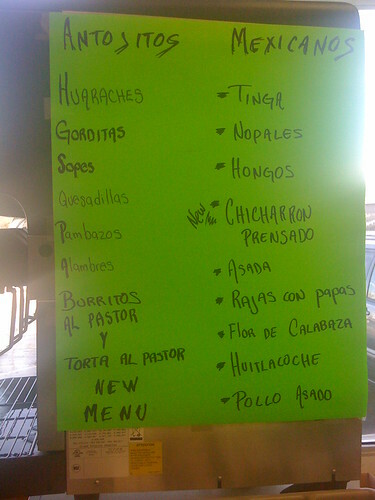 A list of the antojitos served at Chunga's. This sheets is posted on the side out of direct sight. "Antojitos" are little desires or fancies. These are the specialties at Chunga's. Try some of these at your own risk. Pick up a card at Chunga’s and after reading the name and address on the front, you flip it to the back and you read “El Famoso Taco Al Pastor Del Distrito Federal“. This is indeed the same famous taco which is an institution in Mexico City. If you talk to many mexicanos in our city, they will tell you that if someone claims to make a good taco al pastor, they must be from Mexico City. Such is the case. The cooks here know their stuff because they are indeed from that giant sprawl of a city. The tacos usually have their sauces and veggies pre-loaded. They are ready to go. Not much needs to change except the optional limes provided on your plate to squeeze on if that’s your style. Cucumber slices are also provided as a post-taco refreshment. As a test to see if these are really authentic tacos from the D.F. last week I brought my father (papa de Burgersmoke) with me to try the place out. We have a tradition of checking out various new Mexican restaurants since he once lived for several years in Mexico City. After ordering and receiving a warm welcome from our server, we sat down and prepared ourselves. When the tacos al pastor arrived, the eyes of papa de Burgersmoke rolled into the back of his head. He didn’t speak for a few more bites. When he spoke again he said, “when I eat these tacos I instantly feel like I am in the middle of Mexico City.” Case closed. 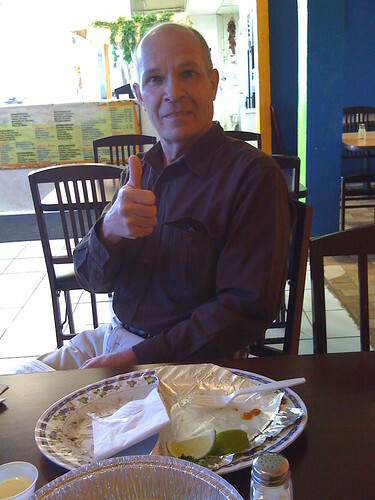 Papa de Burgersmoke giving his thumbs up approval of the Mexico City style Tacos al Pastor. If you get a chance to meet Gilberto the owner of the restaurant, make sure ot say hello. 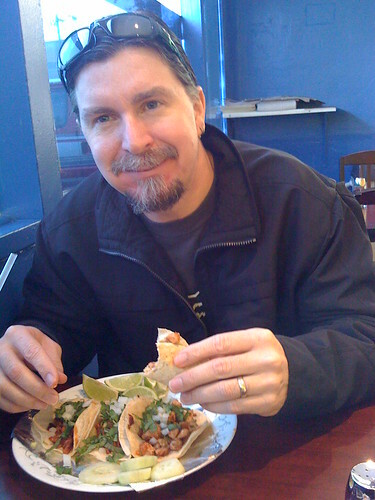 He is an incredibly friendly guy and he is passionate about providing a higher quality taco. He claims you will not find any fat in the meat. He is right. He shops around to find high quality meat and you will notice the difference. Also, he loves a challenge. Make sure to ask him about the 27 taco challenge. If you think you can handle it, order them up and if you can eat 27+ tacos in 45 minutes with only one drink, you and your family eat for free. Several people have done it and Gilberto laughs out loud talking about it. He even says that he is often surprised by americanos like me who aren’t very big that can put away that many tacos. So someone try it. Tell us about it. I want this website to be a website of champions. It’s because of restaurants like this one that I decided to re-launch my career in taco journalism. So go check it out. It’s only a few blocks away from Red Iguana. You’ll feel a lot more at home, you’ll eat well and you won’t have to wait in the cold for your table. Gilberto tells me that he just might invite the public to eat for free on the day before the opening to give a chance to experience the quality of the tacos and their meat. If you live down there, please go check it out and report. We would love pictures and reviews of the new location.